The Easdale loom Diner Chair is available in two colours – Charcoal / White – with the weave wrapped around a reinforced aluminium frame making the whole set lightweight, durable and rust free. The feet are capped with plastic caps so as not to damage the surface the set sits on or the set itself. 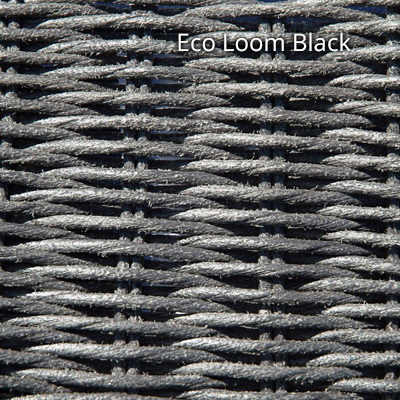 Ecoloom is a synthetic fibre manufactured by Ecolene and based on the original, ‘paper-loom weave’ first made famous by specialist furniture manufacturer Lloyd Loom. All Ecoloom products are protected for 3 years after date of purchase. However whereas the original paper loom could only be used indoors Ecoloom is perfectly suited to outdoor use. It is tested for tolerance a huge range of temperatures without degrading or fading. 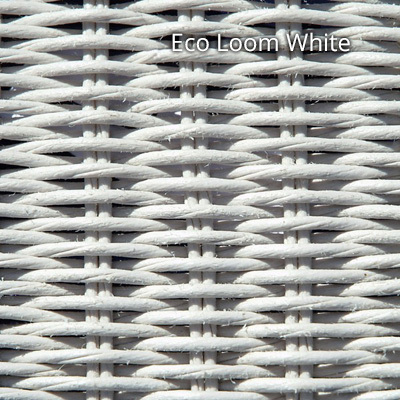 The manufacturing process uses no harmful Cadmium, Lead or Chromium unlike other brands of synthetic rattan. The textured surface looks and feels like the original paper loom. It has a high resistance to water of all types including chlorinated water making it perfect for use in environments with swimming pools. Very quick and easy to wipe down – making it virtually maintenance free. The colours on an Ecoloom rattan-weave are just as vibrant as those in the wood and abaca ranges and are colourfast as well. The texture replicates that of the original paper loom perfectly. For further help and assistance with your purchase please speak to our friendly Sales Team in the Midlands.